Home Uncategorized Utilize, Improvise, and Git ‘er Dun! 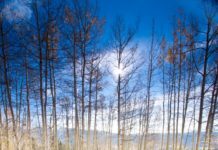 Sometimes when we want to do something, we get hung up because we think we don’t have the right equipment to successfully complete the task. Learning to think outside the box can free us up and help us to move forward. The same holds true when treating a hoof problem. Don’t wait just because you don’t think you have "all the right stuff". Improvise with what you’ve got. One of my friends was having an on-going battle with thrush, so I suggested an initial high-powered White Lightning soak, and follow-up with daily, or as needed topical application of her choice. 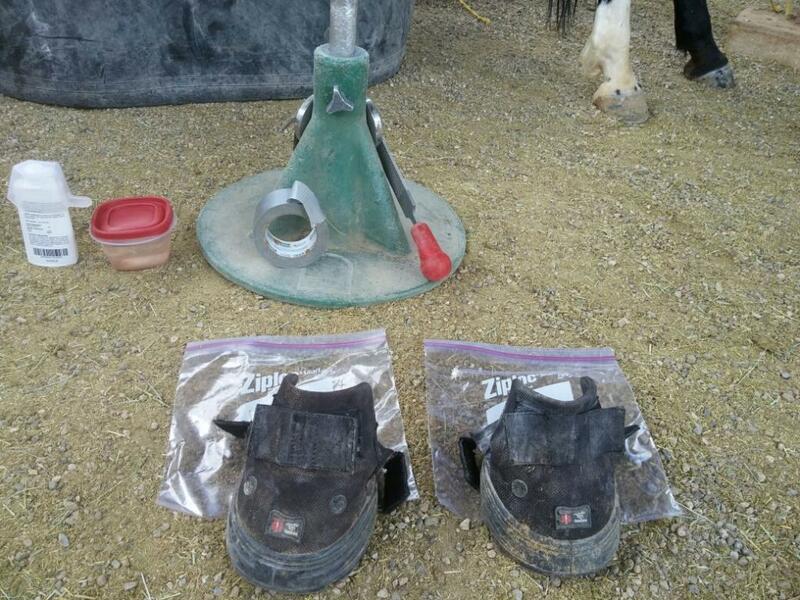 I explained how to do the White Lightning soak using the EasySoaker and some special heavy-duty plastic bags, sold at a local farrier supply store. 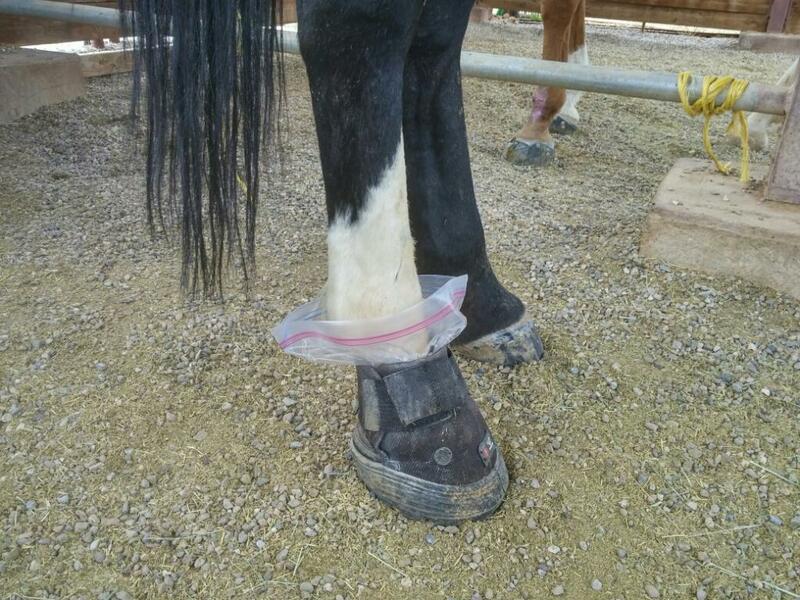 Since we did not have time to run out to the farrier store for the special bags, we improvised, and found some giant heavy-duty plastic freezer bags. The owner then indicated that she had every other boot imaginable, but did not have EasySoakers. 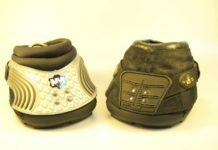 I took a look at her boot collection and selected a couple of Easyboot RX’s that were one size too big. 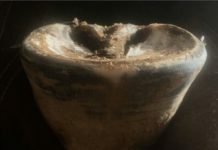 After carefully smoothing any rough edges on the hooves with the fine side of my rasp, we slid the gallon size freezer bag onto the hoof like a sock, then slipped on the RX boot. 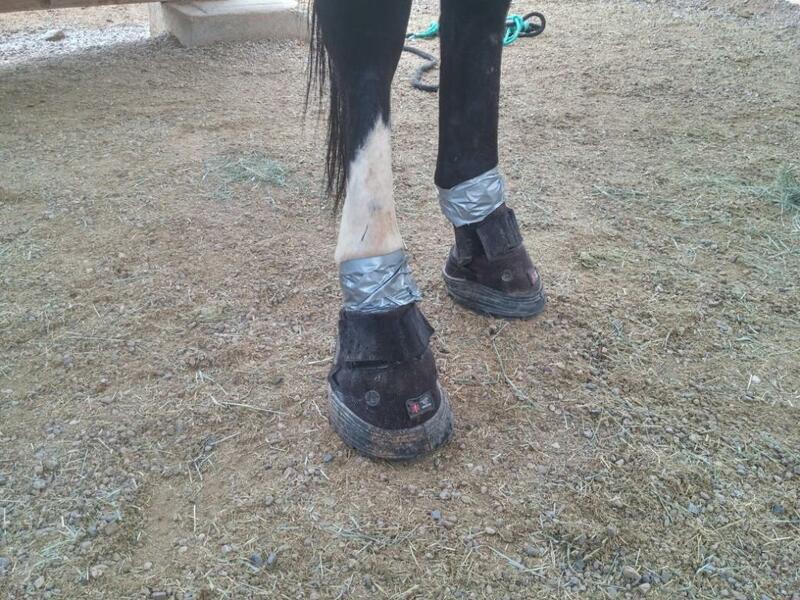 To save time, we worked on both front hooves first. We fastened the hook and loop straps, added the White Lightning mixture, and sealed the top of the bag with duct tape. The extra big plastic bag took up some room in the boot, providing a secure fit for the duration of the soak. The horse was put up with hay, and allowed to move freely around the stall. The soak mixture did it's work, and after 45 minutes we removed the boots and bags, dried the hooves, and re-booted him in a pair of original Easyboots to allow the hooves further drying and hardening time while protecting the sole, frog, and collateral grooves from dirt. (In the future, the new ZIP might also work well for this purpose!) Then we set to work on the hinds. Miraculously, the freezer bags survived the first round with no holes. We used them for the hinds as well with great success. I recommended daily hoof-picking and application of No Thrush powder as needed. The horse continues to improve every day. Moral of the story, address the problem, don’t stress about what you don’t have, and get creative with what you do have. Your horse will thank you! Originally from New England, I finally heeded the advice of my "Inner Cowgirl", packed up my horses and moved west to Arizona. Here I learned the finer points of hoofcare and successful booting techniques. I can help you select the right EasyCare product for your specific needs.